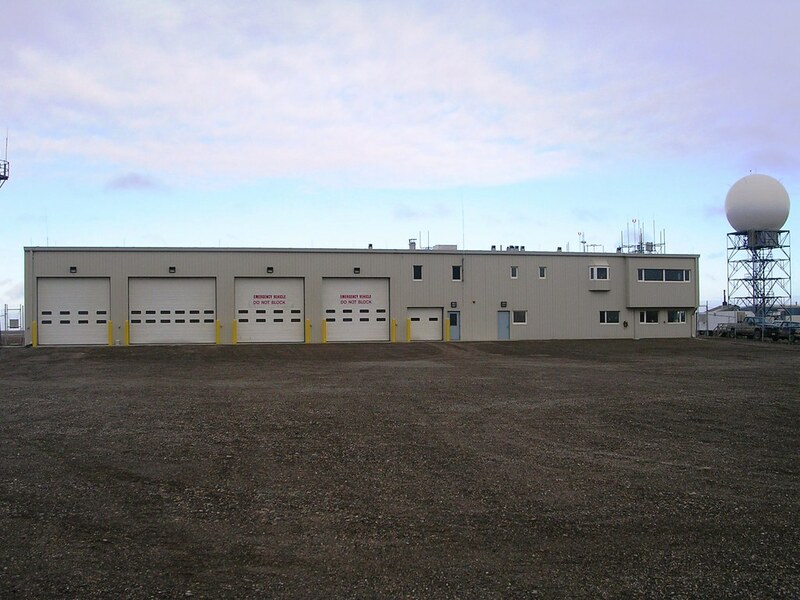 Multiple vehicle bays for emergency response vehicles at the airport, and for maintenance operations. Office/training area, restroom/locker area, living/sleeping area, and storage areas. Control room for flight operations, electronics room for testing and storage, and weather balloon station. Living quarters consisting of individual sleeping rooms with private restrooms, and a large kitchen/lounge area for group activities. Life/safety code issues for the mixed-use occupancies were challenging. 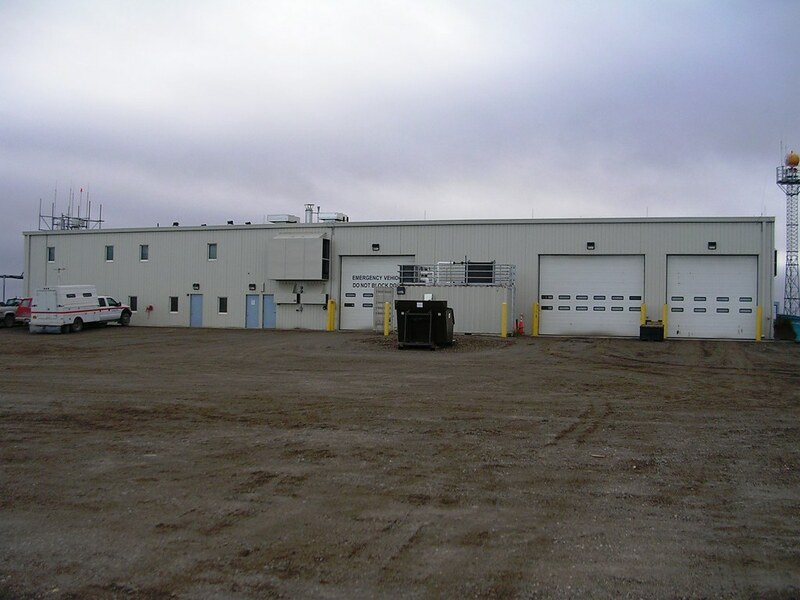 Rated construction provides separation between the shop, office, and living quarters. Permafrost at the site posed a challenge that PDC met with a creative active refrigeration system solution. In 2005, DOT&PF again contracted with PDC to add two more work bays, eight dormitory rooms, and a sand storage bay. Expanding this facility will provide space for more equipment, sand and deicing chemicals, and living quarters for additional personnel. The original facility was built on a pad that had been constructed in the mid- to late 1970s. 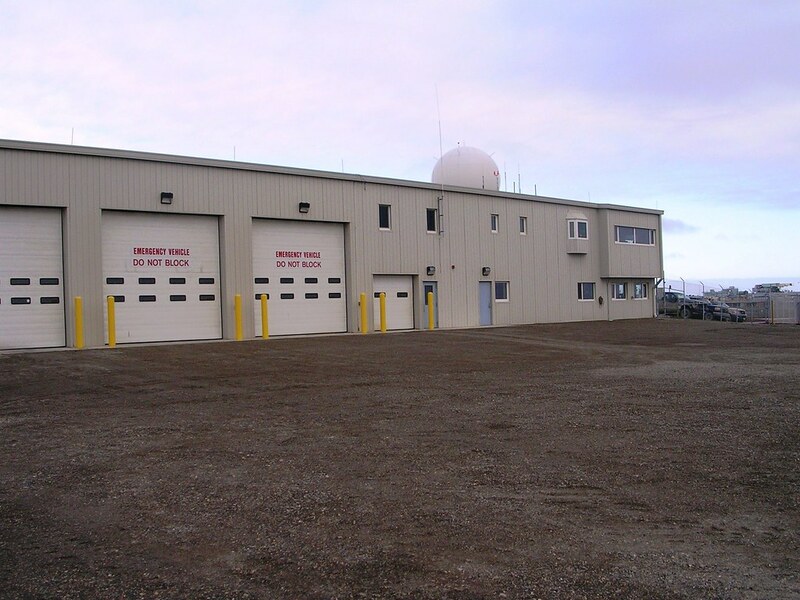 The existing ARFF nearly covered the entire pad, so a new pad had to be constructed for the addition. Bridging the old and new pads was not recommended for this essential facility due to concerns about the possibility of differential settlement. A separate building was designed to house the requested additions, with a corridor link to allow access between the two buildings. The proposed alternative reduces the potential for structural damage by connecting the new building to the older one with a corridor designed to accommodate any differential settlement between the two foundations. Environmental Issues: Deadhorse is an environmentally sensitive area for birds. Spectacled eiders, listed by the federal government as a listed threatened species, breed near the airport. Careful attention to construction timing and adherence to guidance from the U.S. Fish & Wildlife Service are necessary to protect avian habitat. Cumulative impacts (primarily to wetlands) were difficult to determine because there is no local government to ask for a list of projects in the area. We asked oil companies, private businesses, and State agencies to identify past, present, and reasonably foreseeable future actions. On-Site Wastewater Treatment and Disposal: In 2006, PDC studied the feasibility of a proposed on-site wastewater treatment system (Lifewater Engineering’s ExtremeSTP) for the domestic wastewater generated at the workers’ living quarters as compared to the current holding tank/pump/haul operations. The study, which considered existing site conditions, usages, environmental conditions, and cost, found that the on-site system would cost significantly less to operate and maintain than hauling wastewater – the initial capital cost would be recovered in 1 year. The Extreme STP is a pre-engineered unit with three chambers dedicated to pre-treatment, treatment and disinfection, and effluent flow control. Effluent from the unit meets or exceeds the surface water discharge requirements set by the Alaska Department of Environmental Conservation, so it does not require a leach field but can be discharged to the ground surface.